When two agricultural economists bid farewell to another agricultural economist colleague, they don't write mathematical equations, they sing! 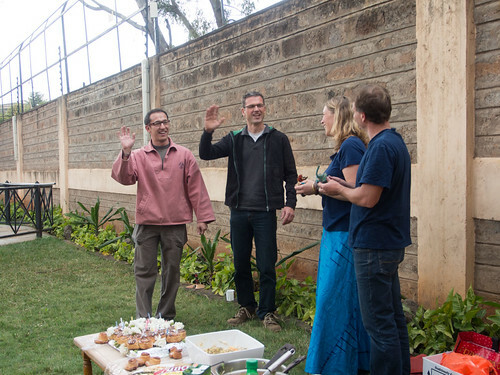 At least, that's what my colleague Nils Teufel and I did to say goodbye to our fellow colleague Signe Nelgen who left Nairobi a few weeks ago to relocate in Washington DC. We surprised her with a special farewell song I adapted from Mozart's Magic Flute and gave her husband and her some African animal mini-totems to protect them along the way. All present contributed food and portable chairs; another colleague had even brought their BBQ! It was a great farewell party.